Lupromax, really? Why you so scared? I was going about my usual day activity this afternoon when my iPhone suddenly buzzed. 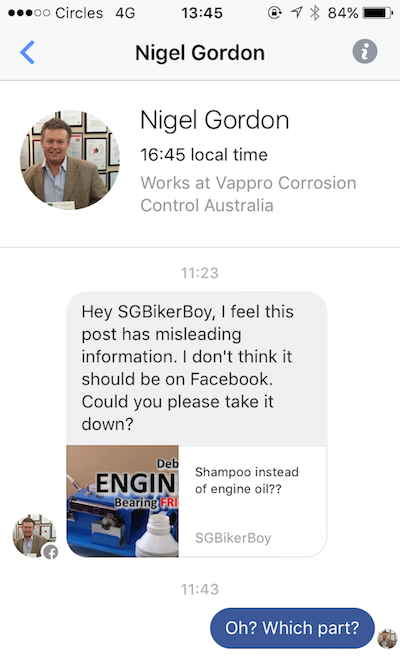 Turns out, I received a facebook page comment and a private message at about the same time. Woah! Pretty impressive credentials there. Managing Director of multiple companies, and Director at Magna Australia Pty Ltd. Must be somebody important, huh? Hey! 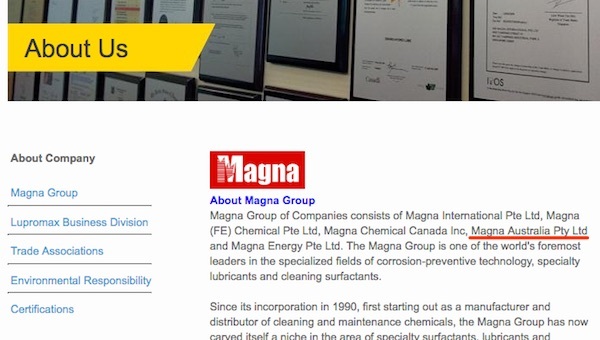 They’re part of the Magna Group – which include Magna International Ptd Ltd, a Singapore-registered company and parent company of the Lupromax brand. In fact, I’ve previously used their oil – the Lupromax Razer 4T on my Pulsar 200NS and commented briefly on it. 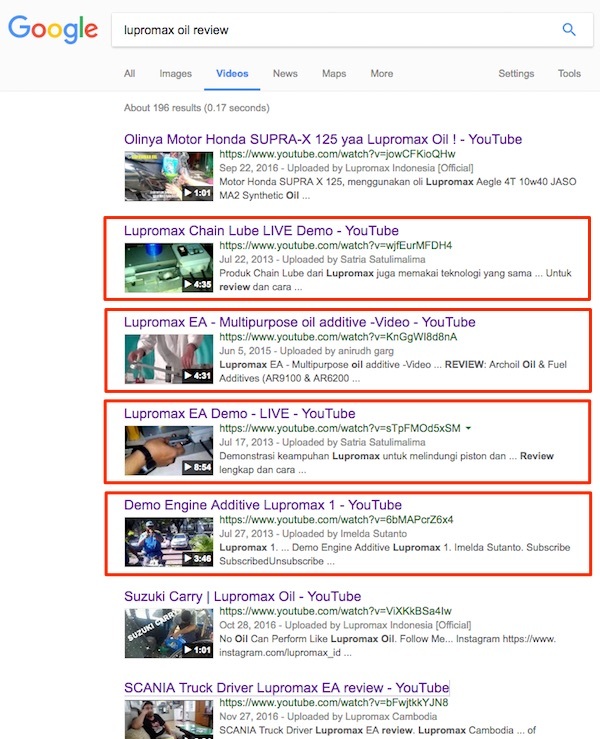 Google search term: “Lupromax oil review”, and looked for videos. Go on, try it yourself! And… of the top FIVE video results on “Lupromax oil review”, FOUR of them (80%) were tests done on a timken machine! Holy Smokes! It was a EUREKA moment for me! This finally made sense! I think I now realise WHY this Nigel Gordon was trying to prevent me from educating the public. Turns out, the information that I shared on how inconsistent the timken bearing test is conflicts with many of the “demo’s” done using Lupromax oil! Information that will likely hurt sales and product perception! As many of you will know, I enjoy a healthy debate. I welcome feedback and comments and love to engage in meaningful conversations with my followers on facebook and on this blog site. And so I was waiting for a reply from this Nigel Gordon guy. 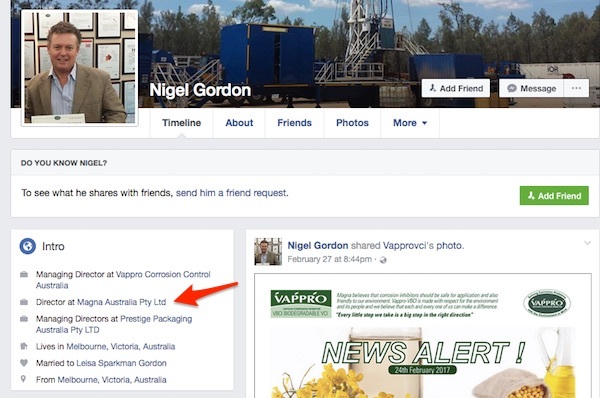 Seriously Nigel Gordon? Legal intimidation? 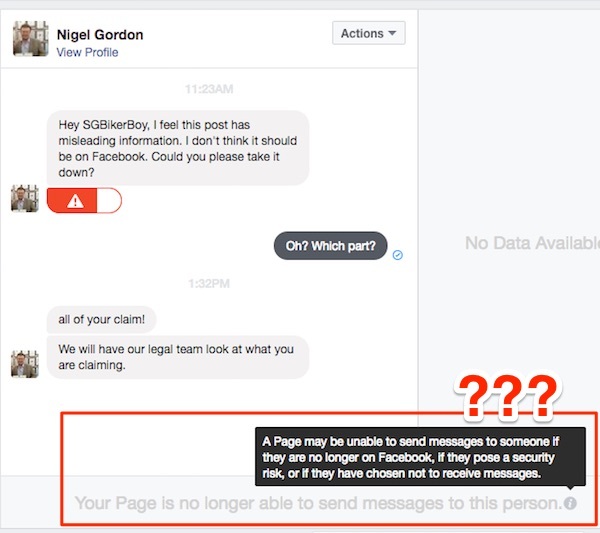 According to facebook, Nigel Gordon is either no longer on Facebook, poses a security risk, or have chosen not to receive messages from me. Hmmm… I wonder which? I do not usually mix the opinions of an individual with that of a company that he represents. Salespeople and employees can sometimes say the darn-est things in the heat of the moment. But Nigel Gordon is no ordinary employee. He is the Director of Magna Australia Pty Ltd. 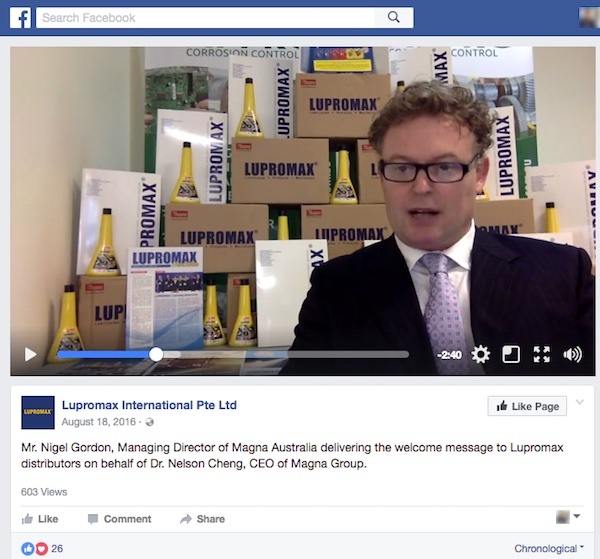 In fact, he speaks about Lupromax on behalf of CEO of Magna Group. I think it would be safe to say that he speaks FOR the company and REPRESENTS the company – probably IS the company. I did NOT write the previous blog post on the timken bearing test to shed bad light on you. For that matter, I didn’t even know that Lupromax has been using the timken machine for demos until now. The post was purely for educating and informing the public. Bravo bro, just bravo. *Thumbs up. Love this post to the max. We should meet up and have coffee some day. Ohhh!! Jameson! I *just* realised what you were trying to say here…..
“Love this post to the max.” = “Love-po-max”! To be honest. I tried and tested lupromax. Frankly its just a gimmick seriously. I stick to and old cheap mobil1 which has been in the industry way longer. I feel my engine perform better. Personally, I won’t go so far to call them an “unreliable oil”. But the unprovoked comments and legal threat was a nasty surprise. Boo on them! somebody give sgbikeboy a medal. what a coward. using legal as a threat is really low. LOL! Quite frankly, this particular product and company didn’t really quite catch my attention…. at least until now. But NOW that it got my attention, I think I might have a follow up piece on them… Stay tuned! Second this! I have used lupromax before too and it feels so bad and lost its lubricant properties so quickly. This oil is just a low grade oil with fancy marketing and nice packaging. Just stick to the established oil companies and you will do fine. I typically refrain from making claims I cannot substantiate, and so wouldn’t go so far to claim that Lupromax is “just a low grade oil with fancy marketing and nice packaging.” Really, the essence of this piece is to highlight the bullying behavior of a Managing Director of an oil company just because I produced a purely neutral piece of educational material that *might* make his company look bad. ahahahahaha you’ve been blocked on FB by him. i have been thru a similar experience. 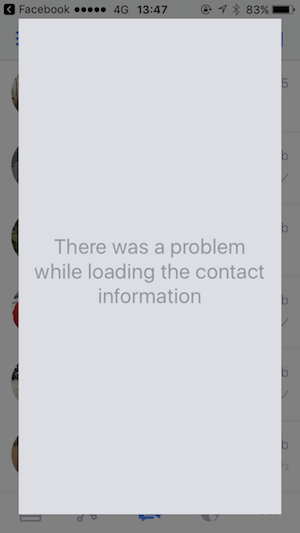 a retard shot me an FB pm accusing me of something then totally blocked me. hello? Baah… leave it. Move on. As a general rule, I don’t let such people bother me. But at the same time, I won’t let such people BULLY me too. They’re quite different! Unfortunately, this happened to fall a little bit on the latter. Well done. Time someone wrote about these “Snakeoils”. Totally agree. Often “Big Petrol Co Brand” oil and old established specialist oil Co (Cast**l, Mot**, El*, Tot**, etc) offer great oil with a lot of $$$ spent on R&D. 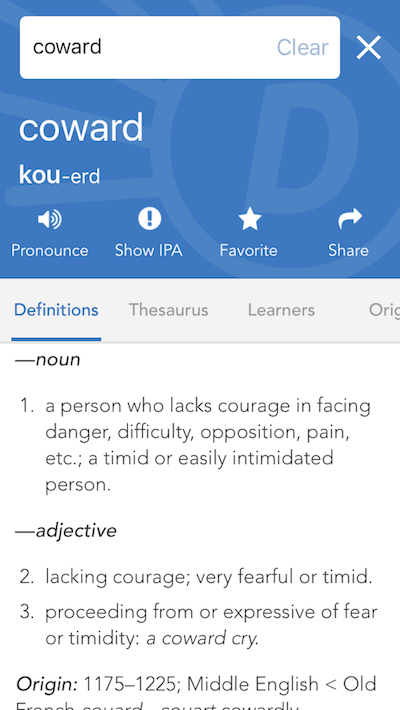 Safe bet for most of us. Lastly, perhaps a tip for all. If I see a new brand of oil, I turn the bottle around to look for the name and address of the manufacturer. Cheapo oil usually dont print full address (no ownership of product). Do that next time you see one one the shelf. There are a lot of half-truths, un-truths, outright (marketing) lies, and deception techniques out there. If you’ve read my previous post, I was merely highlighting a possible one in general. Being *unreasonably* defensive invariably sends a red flag warning and arouses a “snakeoil” suspicion. Great detective work!! The truth shall not be drowned by unscrupulous profiteers. ps: if u got extra time n nothing to do can consider challenging the few oil myths eg does synthetic/semi/mineral oil make a difference? can car engine oil be used? especially with reference to pulsar. 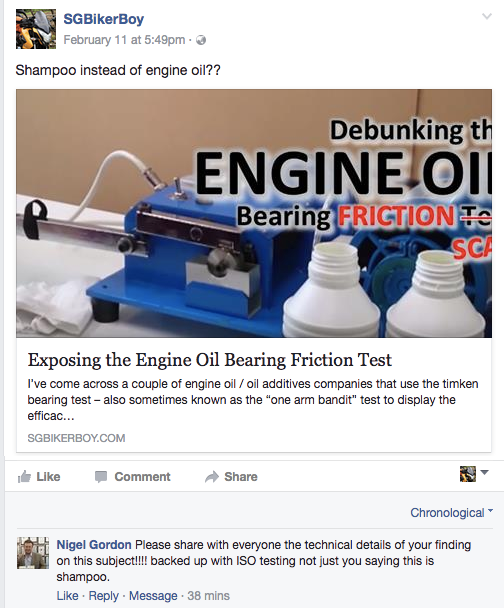 As engine oil discussion (debate) often goes too personal (or legal-hahaha) I do not suggest brands testing. AFAIK, there is minimal viscosity difference between synthetic and mineral oils when new. Synthetics are synthesized in the oil labs, while mineral oils are highly refined petroleum. Biggest difference is that mineral oils tend to break down with use, and start to “thin out” towards the tail end of its life – offering lesser protection. Synthetics tend to be much more resilient and retain their viscosity even towards the tail end before oil change. But I know as a general culture, most Singaporeans change their oils VERY much before the recommended oil change intervals, and thus probably not affected by the mineral oils breaking down. So not much difference here. BUT… to complicate things, it’s the additive package in oils that differentiate the various brands. The “better” (aka more expensive) additives are usually reserved for the synthetic variants, and my understanding is that many (but not all) mineral oils come with (only) basic additive packages. It’s the additive package that adds anti-wear, anti-foaming, detergent, and other useful stuff to the engine oil to keep it running optimally. As a general rule, most wet-clutch motorcycle manufacturer do NOT recommend using oils designed for car engines due to the presence of various friction modifiers within the additive package. While these friction modifiers offer excellent metal-to-metal protection, they are not very friendly to clutches and may contribute to clutch slippages. Thus the JASO MA / MA2 standard was introduced to address just that. Engine oils has always been (and will probably remain so forever) a very controversial topic. It’s very personal what one chooses to feed his engine. So…. don’t get me started on this potentially flaming topic… Hahhaah.